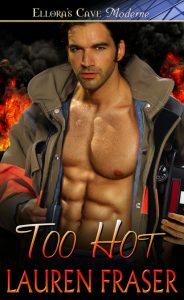 Too Hot comes out this week on August 17th. Yeah. So here’s a little sneak peak. God, he must think she was such a loser. She couldn’t even have a normal conversation. “Umm…sure,” she stammered. Since my new book Too Hot is coming out from Ellora’s Cave on August 17th so I thought it was only appropriate to share a few teasers leading up to the release. Her eyes nearly bugged out of her head as she saw Marco running on the treadmill.Alone in the gym, he ran at a grueling pace. Sweat ran down his bare chest. She followed the path of one droplet as it snaked between the ridges of his abs, through the dark hair under his bellybutton and into the waistband of his shorts. She tried to swallow but her throat seemed to have closed tightly, forcing her to gulp for air. Holy mother of god, she wanted to lick every inch of his body. Here’s a little continuation from last week, Longing for Kayla. He leaned in and pulled her bottom lip between his teeth. His tongue swept out and licked her lip. The forbiddance of kissing her best friend made her shudder and she leaned against him. God, if this was a dream she never wanted to wake up. Welcome to Six Sentence Sunday. Today I thought I’d share a little teaser from Longing for Kayla. “Oh yeah, you have a fantasy, do you?” Jesse asked with a smirk on his face. Chris and Jesse both stared at her with their mouths hanging open.